Natalie Tan’s Book of Luck and Fortune has made She Reads’ Most Anticipated Books of Summer 2019! Good Housekeeping includes Natalie Tan’s Book of Luck and Fortune as one of their picks for The 25 Best New Books for Summer 2019. You can read the full review here. Natalie Tan’s Book of Luck and Fortune has been included in the wonderful list of Buzz Books for Spring/Summer of 2019! Exclusive Cover Reveal on HEA USA TODAY is live! The cover of Natalie Tan’s Book of Luck and Fortune is out and you can find it on HEA USA TODAY here. NATALIE TAN'S BOOK OF LUCK AND FORTUNE will be available in the UK! Harper Impulse has acquired the rights to publish my novel in the UK! The details are below. I have a guest blogpost detailing cultural expectations and the character of Xifeng from Julie Dao's FOREST OF A THOUSAND LANTERNS. I hope you enjoy it. I was a guest on Claribel Ortega's Write or Die Podcast. We discuss the hardships of querying and the publishing process. You can find the interview here. I was a guest on Bryan Aiello's podcast. We talked about books, culture, and food. The link to the interview is here. After winning two books at auction for six figures, Cindy Hwang at Berkley will publish Roselle Lim’s debut novel, Natalie Tan’s Book of Luck and Fortune. Jenny Bent at the Bent Agency brokered the deal, which includes a second, currently untitled novel, for U.S., Canadian, and translation rights. 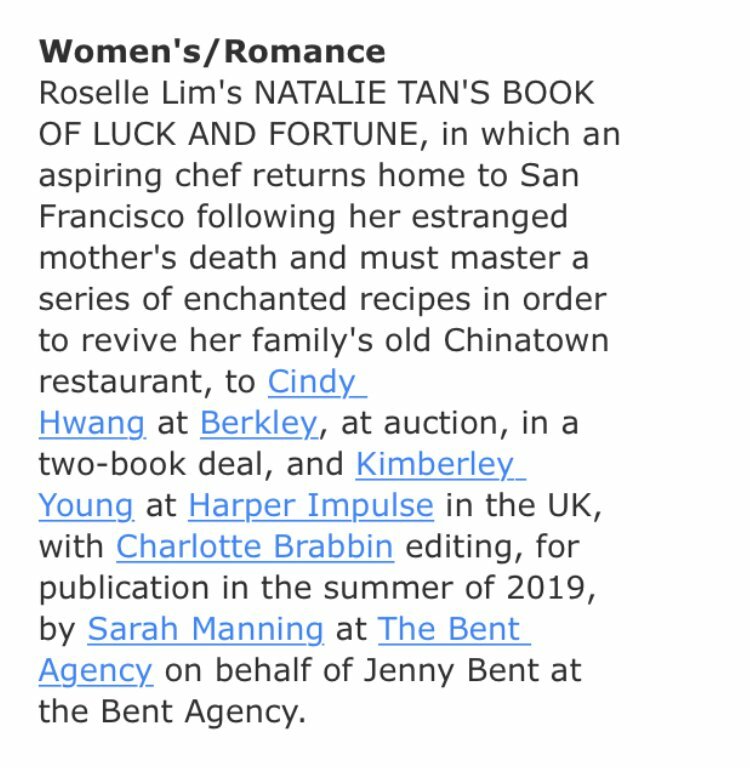 Berkley said Natalie Tan, slated for summer 2019, is “a heartwarming novel of magical realism in which an aspiring chef returns home to San Francisco following her estranged mother’s death and must master a series of enchanted recipes in order to revive her family’s old Chinatown restaurant.” The second book in the deal is scheduled for summer 2020.